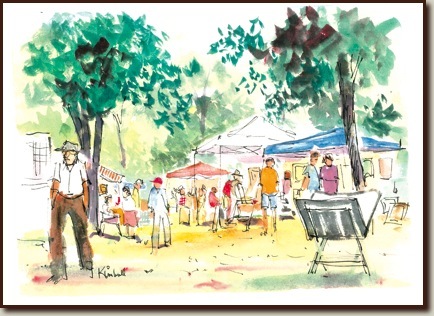 The Medford Historical Society will be having their Annual Art Show and Sale at historic Kirby's Mill located at 275 Church Road at Fostertown Road in Medford on Sunday, August 4th, 2019. The show begins at 11:00 am and concludes at 4:00 pm. Live music will be provided by Bobby LoRusso, with Old Tunes, Folk, and Blues, and light refreshments will be available for sale. This event is Free to the public, and free parking will be available off Fostertown Road. This event will be held outside on the grounds of Kirby's Mill, and no handicap access is available inside the Historical building. Although the event is free, donations will be accepted, however, it is not required. Participants are requested to complete their registration form below no later than August 5th, 2018. Spaces will be assigned as registrations are received. Tents are permitted for your displays; plan on a space approximately 10 feet square. You may set up your display any time after 8:00 am on the day of the event, however, displays must be set up no later than 10:30 am. This event will be held rain or shine. Artists are encouraged to be outside since it is usually cooler outside than inside the Mill. Exceptions will be made as needed and as space allows. Members and the Public are invited to the FREE EVENT. If bringing a tent, what size? By checking this box I am I hereby release the Medford Historical Society/Kirby’s Mill from any liability pretaining to this event.